Health and safety site induction training kit for non-trainers! All operatives must be inducted on site, and this kit provides all the necessary equipment to carry out this training. The folder is presented in the form of a flipchart, with trainer guidance notes on reverse, and highlights all the issues that new operatives need to understand. 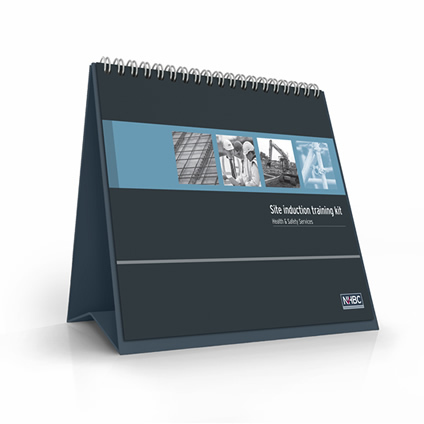 This training kit can be made site-specific and also includes illustrations (handy for non-English speaking workers), site rules cards, helmet stickers and a register for recording inductions. NHBC can help you achieve your training and development goals with a range of construction-related courses and qualifications tailored for the house building industry. The NHBC awards and events recognise, reward and share industry best practice in build quality. Available to both registered and non-registered customers, NHBC Technical Standards are your essential guide to house-building from foundations to roofs and finishing. A range of support materials to help manage your health & safety on site, including training kits and information packs for owner-occupiers. Find all the NHBC promotional products you need, including site flags, flag poles, new site starter packs, site boards and plaques. NHBC publications include the Housing Market Report, warranty policy brochures and free Building Control technical guidance documents to help you stay compliant.